Recreation and Sport - Fansterdam! Activities and fun are hardly a monopoly of the City. The Amsterdam metropolitan region holds ample opportunity for fun and exploring. 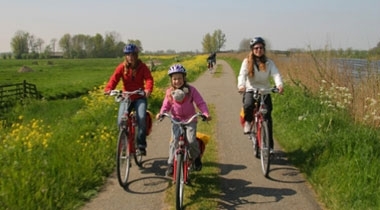 There are castles and fortresses to visit in old Haarlem; plenty of country cycling in Waterland to see old windmills; sand dunes and beaches along the coast; rivers and world famous fields of flowers in the Amstel region; and tiny old-time harbor towns like Edam to explore. To learn all about things to do and see in the AMA, visit I Amsterdam's interactive map. A discussion of Amsterdam sport would not be complete without mentioning their football fever! (That's soccer to us Yanks). The Amsterdamsche Football Club (AFC) Ajax is the professional football club of Amsterdam and they are the seventh most successful European football club. The team plays at Amsterdam Arena which is just southeast of the main city in the Zuidoost burrough. To learn more about this exciting team, check out their English language website. Biking around the AMA provides multiple opportunities for beautiful photographs. It is the best way to see the country. Here are some of the things you might see. It's always a good day for a bike through the AMA!